If you have pressure calibrator needs over 10,000 psi, here’s something you can try. Use a pressure calibrator with an integral pump and combine it with an external pressure module to calibrate up to 10,000 psi. A pressure calibrator can also be portable. Portable pressure calibrators are used to calibrate pressure gauges, transmitters and transducers. Hand pumps are available as pneumatic or hydraulic pumps. Pneumatic hand pumps generate pressures of up to 600 psi. Hydraulic hand pumps generate pressures up to 10,000 psi with a few squeezes of the pump. These pumps utilize distilled water or hydraulic fluid to achieve high pressures. 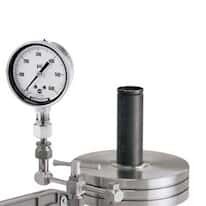 Deadweight testers are ideal for calibrating, setting, testing and repairing pressure measurement and control devices. Deadweight testers feature two-stage hydraulic pressure generators for pressures up to 10,000 psi. Weights generate the necessary pressure level to test your gauges, transmitters, or transducers.